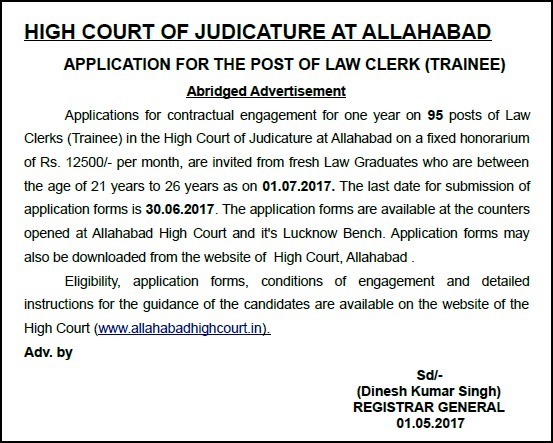 High Court of Judicature at Allahabad had released an Abridged Advertisement for 95 Law Clerk posts. These posts are for contractual engagement for one year. Selected fresh law graduates will be posted on a fixed honorarium of Rs. 12500/- per month after selection. The last date for submission of application forms is 30.06.2017. Allahabad High Court Law Clerk Application form:The application forms are available at the counters opened at Allahabad High Court and it's Lucknow Bench. Application forms may also be downloaded from the website of High Court, Allahabad. Age Limit: 21-26 years as on 01.07.2017.
as an advocate or engaged in any other profession or vocation/service. of August, 2017. Candidate should have Computer knowledge, i.e., Data Entry, Word Processing and Computer Operations. The application forms can be purchased from the counter in the High Court of Judicature at Allahabad and at it's Lucknow Bench on payment of Rs. 300/- in cash. The application forms are also available on the web site ( www.allahabadhighcourt.in ) and may be downloaded and used subject to payment of application form of Rs. 300/- to be paid through bank draft drawn in favour of Registrar General, High Court of Judicature at Allahabad. Registrar General, High Court of Judicature at Allahabad either by Speed Post, Registered Post with AD or through Courier. Last Date: 30 June 2017. 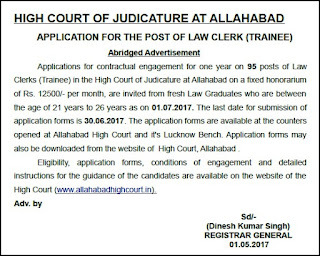 Check out the Allahabad High Court Law Clerk notification from link below for all details.